Time after time over the past fifty years, the National Employment Law Project hasn’t backed down from the toughest challenges. When a new congressional majority rode to power in the 1990s on an agenda that demonized civil legal services and defunded NELP and groups like it, NELP stood strong. 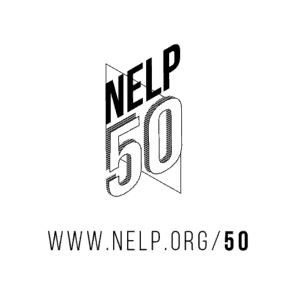 Despite this existential attack, NELP soon initiated a landmark campaign alongside people who received public benefits, who were also in Congress’s crosshairs, re-envisioning the organization’s advocacy and helping to chart its direction for coming decades. At the time our resources were threatened in the early 1990s, NELP was a federally funded legal services “backup center”—one of a national network of organizations that developed expertise in key thematic areas to support legal services providers around the country.The backup centers were so effective that it’s no surprise they were targeted early on by opponents of the law reform movement. The Republican Party took direct aim at federally funded legal services in its 1994 Contract with America campaign platform, and the incoming Congress took a series of steps in 1996 to restrict legal services advocates, including by completely defunding NELP and all of the other backup centers. In effect, Congress refocused federal legal services funding on representing individuals by limiting their ability to pursue structural reform. NELP’s back was against the wall. “We were getting by on the attorneys’ fees generated by a big Title VII test case that we won a few years earlier,” recalls Maurice Emsellem, currently NELP’s longest-serving team member. But at the same time, the organization was finally free to pursue zealous new advocacy in partnership with people who received public benefits who were also targeted by Congress. Indeed, months after the legal services cuts, Congress also passed (and President Clinton signed) a so-called “welfare reform” law (with the Orwellian title of the Personal Responsibility and Work Opportunity Reconciliation Act of 1996). A cornerstone of that law was to impose work requirements on individuals receiving Temporary Assistance for Needy Families – purportedly to promote “self-sufficiency,” but ultimately a thinly veiled screen for a longstanding campaign to attack public benefits through racist messaging. Questions soon arose about how people mandated to participate in these “Workfare” jobs in return for benefits would be treated when it came to core workplace protections, including minimum wage, overtime, and on-the-job safety-and-health laws, not to mention those that prohibited discrimination and harassment. In some cities, people mandated to participate in Workfare could be working alongside city employees; but instead of collecting a decent paycheck, they got basic TANF benefits, which paid less than the minimum wage. The workers noticed—all of them. And they began to organize. Public employees represented by AFSCME understood that people in the Workfare program were not only being vilified, but that they were being pressed into undercompensated labor while undermining public-sector professionals in many cases. Meanwhile, people mandated to participate in the Workfare program in New York City began to organize with the aid of established groups like the Fifth Avenue Committee and relatively new ones like Community Voices Heard. The same was happening elsewhere in the country with organizations like the Philadelphia Unemployment Project and People Organized to Win Employment Rights (San Francisco). That’s where NELP’s expertise came in. “We were able to apply everything we knew about employment laws to the new realities of Workfare workers,” Emsellem says. 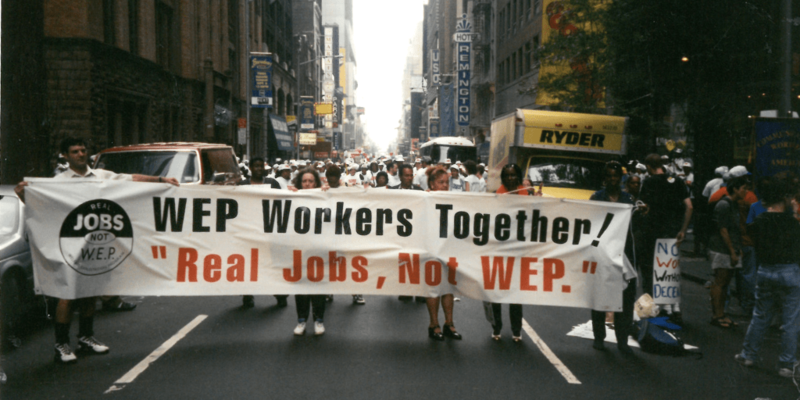 WEP Workers Together marching in New York City’s Labor Day parade with Communications Workers of America Local 1180. But NELP wasn’t the only backup center involved, joining with the Center for Social Welfare Policy and Law (now the National Center for Law and Economic Justice), and local legal services offices like Community Legal Services in Philadelphia (CLS), Empire Justice Center, and Greater Boston Legal Services, all of which had their own rich history of advocacy around public benefits. Union advocates from the AFL-CIO, AFSCME, and SEIU also played crucial roles throughout the campaign. Together, we built bridges between these key players—the workers organizing on the ground, labor unions, legal advocates, and policymakers—fighting for key protections for people in the Workfare program. In 1996, with additional help from Sharon Dietrich, an experienced CLS attorney, the NELP team published a key early report, “Employment Rights of Workfare Participants and Displaced Workers.” The report kicked off a (successful) federal campaign culminating in a landmark guidance issued by the U.S. Department of Labor and the EEOC concluding that most people in Workfare jobs are due labor protections—including coverage under minimum wage and overtime protections—just as any other workers would be. Karen Kithan Yau, NELP’s first Skadden Fellow, established a legal clinic at Community Voices Heard to address Workfare and related problems. As Yau, now a plaintiff-side employment attorney specializing in wage and hour protection for low-wage workers in New York, recently explained, “Lawyers who do the best work are working with the communities who are directly affected.” While Yau mainly supported CVH’s workfare worker organizing, she also helped CVH address its individual members’ needs in navigating the new work requirements and their collateral effects, for example, in parental rights termination proceedings. But equally important, they were together drawing upon (and building upon) a model of collective resistance intended to impact policy reform. In effect, Yau worked with CVH and its members to align the campaign’s legal strategy and organizing strategy. Those efforts also informed NELP’s broader advocacy. NELP pursued cutting-edge advocacy against government entities, and engaged in several lawsuits urging coverage under the Fair Labor Standards Act and state workplace laws for workers in the Workfare program sent to clean public parks, work in Social Security offices, and even to dig graves for a city cemetery. In several lawsuits NELP filed, the defendants ultimately paid people in the Workfare program the minimum wage, and they prohibited working overtime hours. NELP authored amicus briefs in a number of other leading cases, including Colon v. City of New York, which found that people in the Workfare program are covered under Title VII. Between the steady drumbeat of litigation victories and the federal guidance, states began to change their practices and increasingly considered people in the Workfare program to be covered by labor and employment laws, which in the end help limit the expansion of these programs. The partnerships NELP forged with groups like CVH helped us sharpen our ongoing commitment to working with workers and communities organizing on the ground. In the narrowest sense, despite mounting evidence that work requirements don’t improve the lives of those they target, the Trump Administration has redoubled its efforts to add them to a variety of federal programs like Medicaid. NELP continues to oppose these requirements and advocate for the workers who are subject to them. The partnerships NELP forged with groups like CVH helped us sharpen our ongoing commitment to working with workers and communities organizing on the ground. The past twenty-five years have been marked by exciting campaigns waged alongside day laborers, homecare workers, and immigrant– and Black-led worker centers, among others. More generally, NELP still won’t back down no matter what challenges we may face. 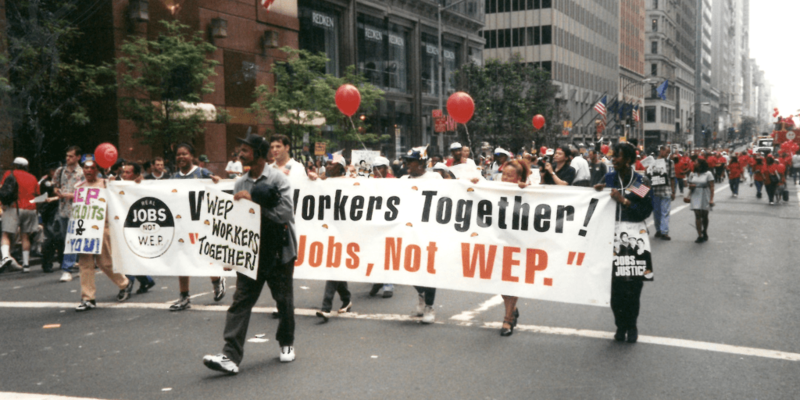 Whether it was finding new funding sources in the mid-1990s or standing up to a presidential administration that favors the powerful and well-connected over the workers that they claim to put first, NELP continues the fight alongside workers who are building power every day.